"My husband and I have been flotilla sailing in the Med for our holidays for about 6 years now, and it is one of the best ways to spend a week. Approaching thesmall fishing village or town from the sea is the most evocative sight, especially knowing that a well-earned drink and evening meal in a local restaurant are to come. I cannot recommend it enough as a family holiday, with friends or on your own, as the other people on the flotilla are usually friendly and fun. Obtaining our Day- Skipper certificate was interesting and enjoyable, and allowed us to start our first flotilla holiday with some confidence"
Sailing Holidays tend to fall into 3 categories, Charter Holidays, Flotilla Holidays or Learn to Sail Holidays. Have a look at the following information to find out which one suits you best, then check out our links page for details of companies who provide these types of sailing holidays. Charter sailing holidays are available around the world, including the Greek Islands, Turkey, the French Rivera, the Carribean and the Seychelles. Check out some of the companies given on our Links page for further ideas of where to travel. Bareboat charters are aimed at those who can sail confidently. 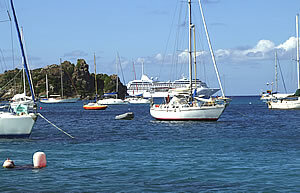 This type of sailing charter gives you the freedom to choose where you go and to travel at your own speed. Most boat charter companies will insist that you have an appropriate qualification and will most likely wish to see the relevant documentation. Most bareboat charter yachts come fully equipped with everything you will need, from safety equipment to galley equipment, bedding & linen. If you do not have the relevant experience to skipper a large yacht yourself, but would still like to enjoy and independent sailing holiday, you can often hire a professional skipper to take charge of the boat. They will often give instruction on how to sail the particular yacht you have chartered, and can give you guidance as to the best places to visit in the local area. If you are not interested in sailing the yacht yourself but would just like to enjoy the experience of a sailing holiday on a luxurious yacht, why not go for the option of a Crewed Charter. These sailing holidays include a skipper who will take you where you wish to go, the crew to sail the yacht, and normally a hostess to prepare top quality meals for you to enjoy. This really is the ultimate sailing holiday and could be that super treat for your extra special honeymoon! A flotilla is a group of sailing yachts that in theory sail together in a kind of loose convoy with a lead yacht on hand to guide you and help with arriving at and leaving from wherever you stop overnight. However, in reality,the lead boat crew give full instructions every morning at a meeting for all the boat skippers, regarding the evening mooring place, how to get there, how to approach it avoiding any hidden rocks etc and they suggest beautiful little bays to stop for lunch and swim off the boat. Amazingly, you can then set off in your boat and not see another boat from your flotilla until the evening rendez-vous, where the lead crew are then standing on the jetty waiting to guide you in and catch the mooring ropes etc. which is extremely helpful.! On a flotilla, you are however still the skipper and therefore responsible for the safety of those on board. 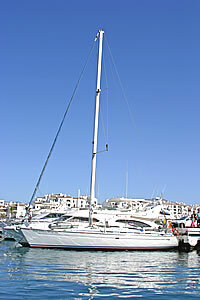 You need enough sailing experience to accept that responsibility. Learn to Sail holidays are offered by many companies, some where the holiday is in the UK, others where you go somewhere warm and learn to sail at the same time as having a wonderful holiday experience. Make sure that whichever option you go for, that the school is recognised by the RYA. Check out their website (www.rya.org.uk) for further details.